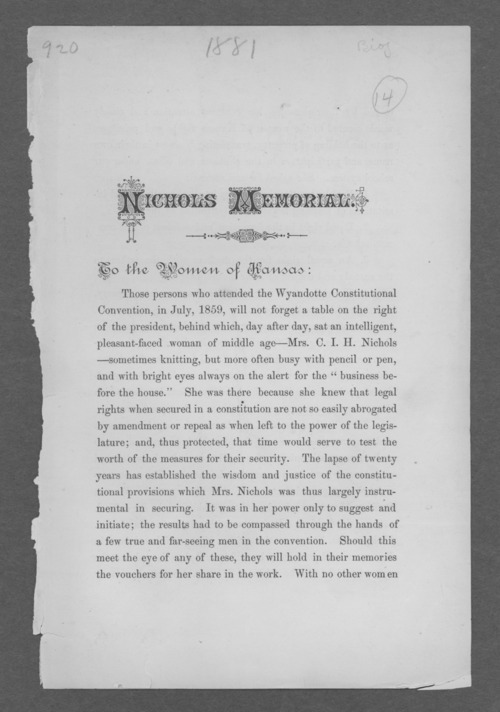 This pamphlet is addressed "To the Women of Kansas" with the purpose of raising funds to include a "steel portrait" of Mrs. Clarina I. Howard Nichols in the soon to be published history of woman suffrage The pamphlet lists the rights for women that were included in the Kansas Constitution, as a result of the advocacy efforts of Mrs. Nichols. These included equal educational opportunities in state colleges, equal rights in forming and conducting "common schools," equal right for custody of children, and the right to hold and accumulate property. The authors emphasized that Mrs. Nichols was not an official member of the convention and could not vote on any of these issues. Rather, she had to persuade the male delegates to support them. The pamphlet was written by Mrs. John P. St. John, Mrs. J. K. Hudson, Mrs. John Francis, and Mrs. F. G. Adams. Evidently their fund raising efforts were successful. There is a portrait of Mrs. Nichols between pages 192 and 193 in Volume 1, Chapter VII "Reminisces by Clarina I. Howard Nichols" in History of Woman Suffrage: 1841-1861 edited by Elizabeth Cady Stanton, Susan Brownell Anthony, Matilda Joslyn Gage, and Ida Husted Harper. Funds for digitizing this item were provided by Marilyn S. Blackwell and Kristen T. Oertel, authors of Frontier Feminist: Clarina Howard Nichols and the Politics of Motherhood. The publication was the winner of the Coalition for Western Women's History Armitage Jameson prize. Creator: St. John, Mrs. John P.